He also served under General Crommer, whose life he saved “with a rather loose interpretation of orders.” Despite the results, General Crommer had him court martialed for that action (86). By this time in his career, he was accomplished enough in his understanding of military law to successfully handle his own defense and turn the tables on General Crommer, who was himself then cashiered from the army. This interest in the law appears to have expanded into criminal and public law, the knowledge of which served him well in a number of his adventures. It may have been because of this experience that Paladin believes that every man should have his day in court. He may well have come from an upper middle class family of some repute. In his youth, he was a bouncer in Scollay Square in Boston, Massachusetts (21) and had already developed a taste for tailored clothers, specifically those by Brooks Brothers. His family sent a small monthly remittance, after the Civil war was over and he had resigned his commission (94), with the agreement that he was “not to go home.” (194) He chose to reside in San Francisco, enjoying the high life of wine, women and gambling. It was the latter that led to a decided change in his life’s path. He is a polymath, a voracious reader who can quote with some accuracy a wide circle of authors of literary eminence and recount the pertinance of many historical events and personages, and a world traveller who immerses himself in the cultures he encounteres. Traveling to India in 1857 and killing his first tiger in the village of Jaunpur on June 20th of the same year, he killed his second in the foothills of the Satpura range. (89) He has also spent a year in the Sandwich Islands (107), visited Van (once a part of Armenia) (16), Spain (42), Mexico (37), Closer to home, he was in Philadelphia, Pennsylvania (58), Laramie, Wyoming in 1871 (17), Buffalo, North Dakota in 1872, (112), Alaska (69) and lived with the Yumas, is respected by the Yavapai, Chiricahua Apache, Pimas, and Opata and rode wth Cochise. (14) It is fortunate, therefore, that he also has an affinity for languages and is to varying degrees fluent in American, Apache, Armenian, Chinese, French, Greek, Hindi, Pawnee, Romany (Romani), Spanish, and Yiddish. He can also tap out Morse code. While naturally a right-handed fast gun, he can also shoot left-handed. (134) Beware when Paladin physically draws himself into a crouch as he strives to present a minimal target. The tiger is getting ready to strike. He has also developed the habit of sleeping with a “hand on his belt, which he refers to as “an occupational disease.” (199) Surviving his chosen profession requires that the speed of his draw be accompanied by accuracy, which Paladin demonstrates by shooting a thrown silver dollar through the middle. Accuracy is also dependant upon one’s ability to see. Regular gunpowder often results in a cloud of smoke issuing from the weapon, which may interfer with the shootist’s ability to see. Thus, as his armorer noted, “I always feel that when matters have deteriorated to a point where a man reaches for his gun, only the finest quality smokeless powder is good enough.” (189) Paladin claims it took him eight months to work out his formula for smokeless powder. (189) The difficulty in developing a smokeless gunpowder was also noted by Alfred Nobel, whom Paladin met in the Hotel Carlton, (185) although Nobel undertook the creation of ballistite because of the challenge of the theoretical aspects of the chemistry. While his adventures begin on a pale horse, he rides a number of different steeds of many different colors including bays (91%), dapple grays (5%), blacks (1.5%), buckskins (1%), and a blonde sorrel and a pinto once (1.5%). Two bays dominate. One has an irregular blaze and front socks. The second sports a white pastern on his left front and sock on his right rear. **** The only mount that Paladin refers to by name is Ezekial (3). How is Paladin described by those who have met him? Paladin’s personal logo – a chess knight. As the only piece that can leap over the other pieces on the board, it is an extremely versatile piece in the game of chess, the successful conclusion of which is accomplished through strategic capture of the king of the opposing side. The prize for winning Paladin’s personal chess game is his own sense of justice and personal honor. Paladin enjoys games of strategy such as backgammon, go, chess, and of course, solitaire. He enjoys playing poker and the horses. It is the former that takes him down a path that changes him from a self-indulgent boy whose world has left him with nothing but his family honor, to a man seeking, in fact demanding, justice in the world. A wild west knight with a reputation for heroism and chivalry. A Paladin. Perhaps the best description of Paladin is found in the ballad written about him. 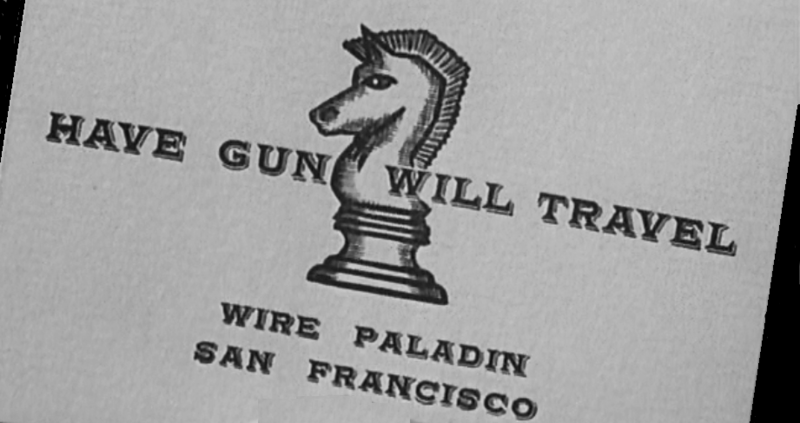 “‘Have Gun Will Travel’ reads the card of a man. Kim Chan, known as “Hey Boy,” in reference to his position as a porter at the Hotel Carlton, is a Chinese immigrant who lives at 49 Powell, in Apt 9. (31) This is about 1.4 miles from San Francisco’s Chinatown, which is appropriate as he lives between the two worlds of Chinese tradition and Paladin’s assignments. They form a comradship, trading secret communications such as, “Ho sai gai” (“Life is good”) and taking verbal pot shots at each other. Unfortunately, he will never share Paldin’s taste for French wine. Kim Chan prefers rice wine, as French wine makes him ill. (103). Her relationship with Paladin is different from the other women with whom Paladin associates. She acts almost as his conscience, deftly moving Paladin towards a more financially responsible existance. The front desk is manned by an unnamed desk clerk, Matthews the Cashier (97), Hotel Carlton Managers Cartwright (107) and McGinnis (152) and Assistant Manager Cartright (185), a decidedly nervous fellow, especially where Mr. Paladin’s adventures are concerned. Paladin often dines in the dining room of the Hotel Carlton and is graciously attended by the steward. (126, 128, 136, 167, 206, 209). *Paladin states that he served with Doubleday at “Chancellorburg.” (121) There is no Chancellorburg in the United States. Abnor Doubleday was at Chancellorsville and Gettysburg during the Civil War. ** There is an Antioch, Tennessee approximately 12 miles south/southeast of Nashville which may indicated that he was involved in the Battle of Nashville during the Civil War. *** The first curveball pitched by William Arthur “Candy” Cunmmings at Worcester, MA occurred in 1867 while he was playing for Brooklyn Excelsiors. However, it was not until Nat Hicks and “Candy” Cummings were on the same team that Cummings was able to really work on the curve ball because Hicks played the position of catcher immediately behind the batter, rather than 20+ feet behind him. While the year quoted may be questionable in actual history, it does assist the viewer to affix the episode and series in “time”. **** This is the gelding that Richard Boone named “Rafter.” Paladin does not refer to any of his horses by name. ***** The Gambler Returns: The Luck of the Draw (1991), (TV). The role of Lady Li is played by Kim Miyori.